Cherries, named after Cerasus, a city in Turkey, are divided into two general groups: sweet and sour. The United States is the world's largest producer of sweet cherries, and Washington state produces about 40 percent of the nation's crop. Varieties of this dark red, heart-shaped fruit include Bing, Lambert and Tartarian cherries. Other sweet cherry varieties, such as Royal Ann and Rainier, are yellow with red tinges. You also know sweet cherries by a different name: maraschinos. To make maraschinos, the cherries are bleached, dyed red and steeped in a sweet syrup. They are named for the Italian liqueur with which they were originally soaked. Sweet cherries are available May through August, with peak season in June. Select plump, glossy, hard fruit. The ripest cherries have the deepest color. Fruit with stems left intact last longer. Refrigerate unwashed cherries in a plastic bag up to 5 days. Freeze individual cherries on cookie sheets until solid, about 1 to 2 hours; transfer to a freezer bag to use later in pies and other baked goods. 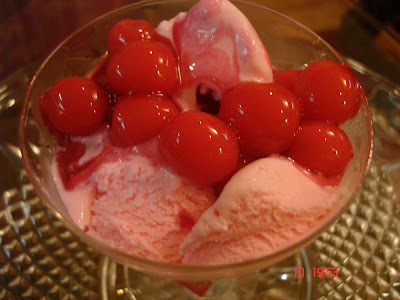 Frozen cherries are at their best only up to 4 months.